High oil prices may have caused the economic collapse of 2008. It took only 5 months for the price of oil to plummet from $150 to under $40 in the second part of the year. Meanwhile oil consumption did not even decrease 10%, so what is the real cause of this collapse you may ask? Hedge funds. Let me explain. During the first part of 2008, Western economies were already slowing down noticeably and hedge funds gradually pulled trillions of dollars out of the market and parked them in energy ETFs. At the time Chindia's insatiable thirst for oil and the "decoupling" of east/west economies had many believe commodities were a "sure thing", a sound enough tangible insurance to protect overinflated assets scavenged from made-up bubbles. On top of that, by using leverage, profits were multiplied as oil went up, not a bad deal in a recession. As we enter 2009 the oil landscape has reversed dramatically from a year ago. The price of oil is lower than production costs and new exploration projects are being cancelled. 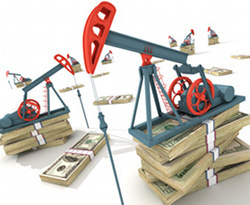 China flush with cash is currently buying all the oil it can get its hands on to pump into its strategic reserves. Once arrogant OPEC countries are willing to sell oil at any price to fund government programs and prevent political instability. One constant however is the depletion of major oil fields, worse than predicted at 9.1% year over year as we close 2008. It's a matter of when not if the economy recovers and when it does, expect a strong bounce back in the price of oil.